I’m on the road until Saturday night. Puck and Riot are at the pet-sitter’s, getting into the eggnog. are they happy or bad when mommy comes back? pansy, they have LOTS of ferret-friends at the petsitters, so they don’t miss us much. Usually they just get pissy at having to go back into the carrier, which they hate. Hmm, the thought of drunken ferrets is a bit frightening, isn’t it? My cats love eggnog. They prefer bourbon to rum though. Drunk ferrets? Sounds like the NOLA City Council to me. Adrastos “Sounds like the NOLA City Council to me.” = epic WIN!!! 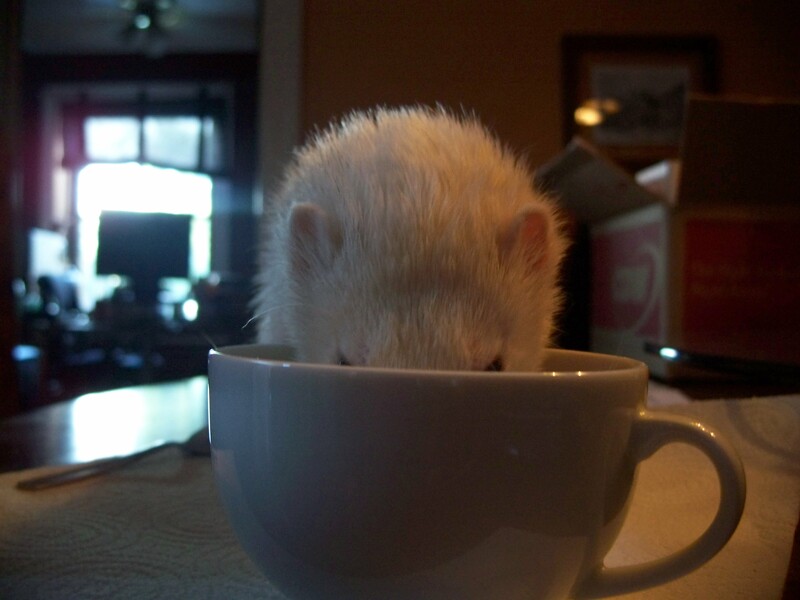 basil likes to ‘steal’ everything but coffee. sybil likes coffee and cream.